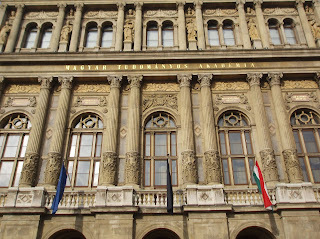 The building of the Hungarian Academy of Science, venue of the 2-day conference. The second day was devoted to "Atmosphere". After the event short talk was arranged with Acedemician György Major, about the proposal of HUNAGI as contribution of the UNESCO-Hungarian Academy of Science driven National Action Plan of the International Year of the Planet Earth 2007-2008-2009.
it was agreed, Dr. László Bozó, new President of the Hungarian Meteorological Service will be informed on this proposed action via Academician Major. The HUNAGI draft proposal elaborated by Viktor Pusztai of EOGEO Hungary has the intention to establish a Hungarian interface of the NASA Global Change Master Directory in close cooperation with NASA partly in the CEOS WGISS framework.